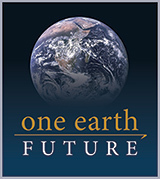 One Earth Future is committed to helping humanity develop and improve multi-stakeholder governance systems which can solve the complex problems it faces. We aim to fulfill this commitment primarily as a builder of bridges and a consolidator of efforts made by stakeholders. Taken together, our programs—Oceans Beyond Piracy, OEF Research, Secure Fisheries and Shuraako—along with our partnerships, are designed to improve global governance through incremental and local community-focused efforts.